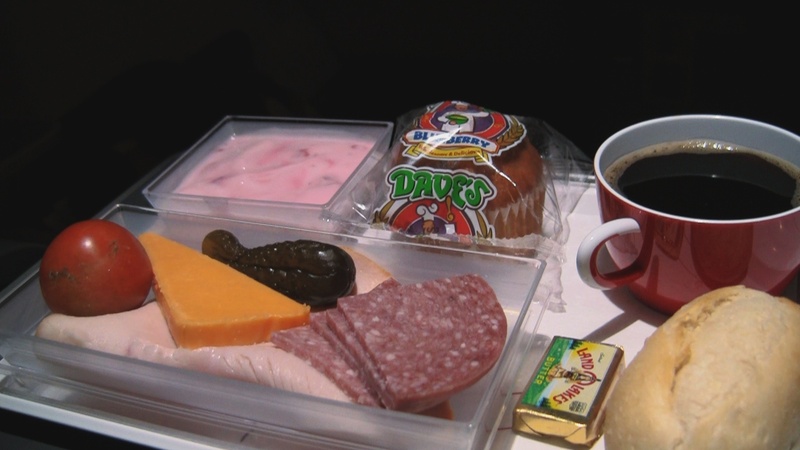 Would you think to combine these items for breakfast when you’re NOT flying? We wouldn’t, but we ate it all. – Pre arrival meal. The Seat: Having known that I had booked row 36, I was surprised to reach the rear economy section of this airberlin A330-200 to find that the exit row seat was numbered 29. Then, looking at my boarding pass see that I had been appropriately switched to this “XL” extra legroom seat at check-in. It took some post-flight research to find exactly what had happened. airberlin had taken over 2 of the same aircraft that had been flown by EuroFly previously and never bothered to change the interior…and frankly, I’m glad. The seats are a very sporty grey leather and feature extra lumbar support for combating long-haul stiffness and adjustable headrests to keep your head from falling into your neighbors lap. As exit seats go these are hard to beat. Both window and aisle seats come with legroom for as far as you can stretch. Often window seats contend with bulky slide compartments attached to the exit door but this one was designed so that it’s out of your way. Another bonus is that wafting odors and hoards of post-meal lurkers are no problem as the washrooms are in the very back of the aircraft. That’s not to say you don’t get the occasional loiterer who decides that you have more legroom than you need and sees it as a place to do in-flight Pilates. Service: Flight attendants moods and job knowledge will vary. 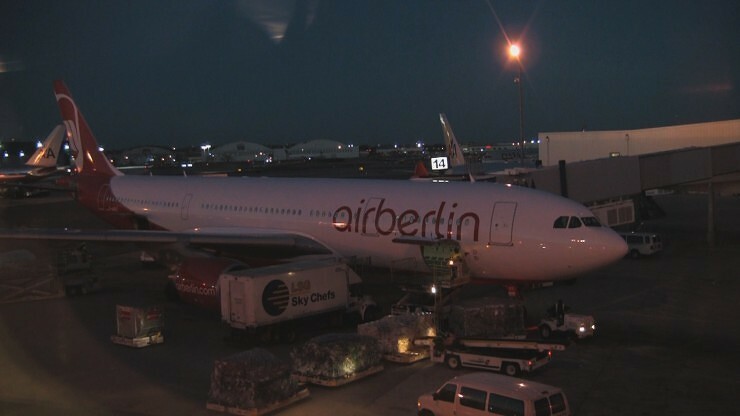 A later airberlin flight showed us service that was just slightly less than satisfactory. This time however, the service was fantastic. The gentleman flight attendant was very helpful in making sure our coffee was refilled and seemed to take pride in how he conducted himself in a very personable manner. It was actually very refreshing to see. Tiny screens with little selection are a bummer, but better than an old-timey single screen movie. Personal TV aboard speical airberlin A330-300. Tech/Connectivity/Entertainment: This is where this configuration loses. While I was happy to have a selection of movies to watch, it’s not the full airberlin touch-screen unit that’s loaded with choices aboard their more typical, updated A330’s. 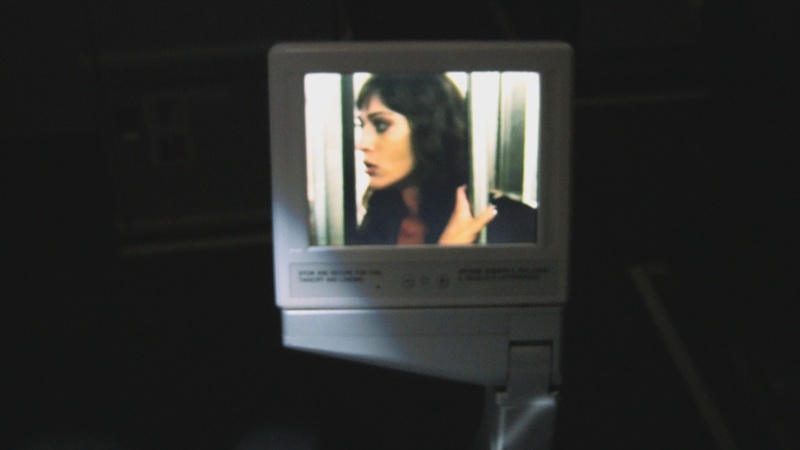 Here you’ll have a rather small personal screen with seven or eight channels of movies that each play in a loop. Miss the first part but want to watch the entire movie? You’ll have wait until it finishes so you can watch it from the top. It’s a bummer, but better than nothing. You’re also without any kind of power port. Something You’ll wish you knew beforehand if your phone or tablet is low on juice. Summary: The extra legroom without the nuisance of nearby lavatories is enough to make me like this row better than it’s normal configuration equivalent. I’m not certain that this airberlin A330-200 configuration will stay the same or even that the airline has long term plans to keep these aircraft, but chances aren’t great that you’ll end up on one of them in any case. If you do it’ll be what we think is an even-up comfort for tech trade. Rating: 3 “hops” (of 5). Strategy: These “XL” exit seats are available for an extra cost at time of purchase and complimentary to upper-elite members of airberlin’s “top bonus” program within 48 hours of the flight. This was a paid upgrade at the time of reservation (under $100).